← New Secondary School for Kings Cross in its Camden part! The saga of 62-68 York Way aka the American Car Wash is an embarrassment. The site has been derelict for donkeys years with occasional renewal of planning permission followed by inaction on site except for the odd bit of furtive hole digging to make sure the planning approval doesn’t lapse. There have been planning permissions for the building since at least 1995. Including for a large hostel that was rejected. The latest round is talk of an attempt to turn it into a hotel. Except for the fact that I don’t think it has planning permission to be a hotel and Kings Cross is jam packed with hotels (thousands and thousands of local rooms from the appalling to the arty). Anyway it’s always helpful to see what the developers have to say and what wider benefits they will bring to the community – they are hosting a show and tell meeting on Wednesday evening 10 July on Killick Street at Winton Primary School Hall between 1830 and 2030 – it’s a drop in session with no need to book or anything i guess you can turn up any time. 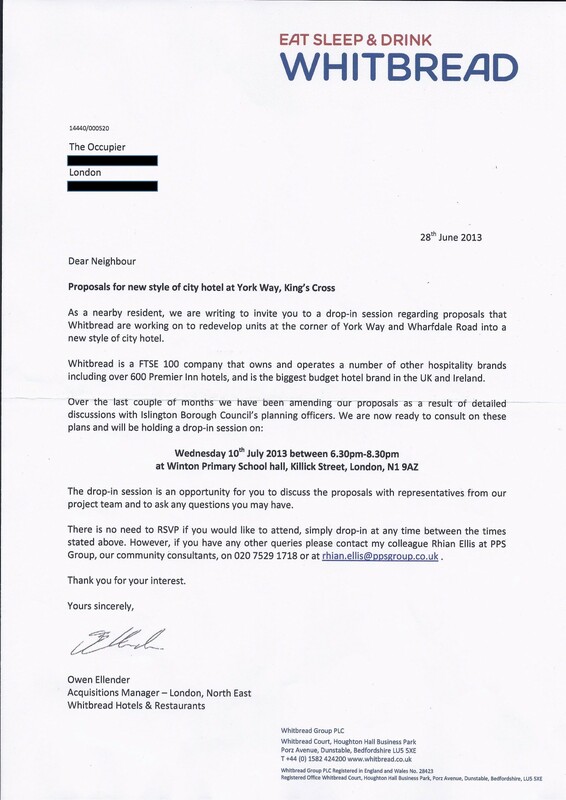 Whitbread, who own Premier Inn have been consulting for months they say with Islington Council planning officers and they are now ready to talk to local people. Which is nice, but feels the wrong way around. This entry was posted in Planning, Licensing and Regulation and tagged 62-68 york way. Bookmark the permalink. We really do not need another hotel in this area, we already have to many hotels and hostels as it is and a new Premier Inn is being built at this moment opposite the British Library, we do not want any more. I live round the corner and do not want another hotel.